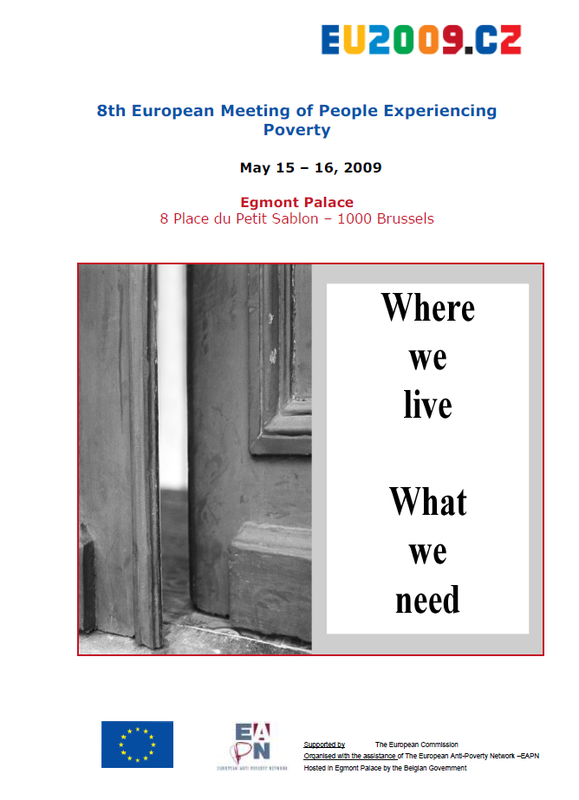 The 8th Meeting of people experiencing poverty took place in Brussels on 15 and 16 May 2009 and addressed the topics of Housing, Financial Inclusion and Access to Basic Services. The basic purpose of this event is to listen to people experiencing poverty, and to establish a dialogue with policy- and decision-makers in the field of fight against poverty and social exclusion at the European level and at national levels. It is organised by the Czech Presidency of the European Union, with the support of the European Commission and of the European Anti-Poverty Network. FULL REPORT of the Meeting in EN, FR, BG, CZ, NL, DE, GR, HU, IT, Norwegian, PT, SL, ES. SUMMARY REPORT in DK, FI, LT, MT, PL, SK. 10 KEY DEMANDS (EN – FR) to the EU institutions from the 8th Meeting of People Experiencing Poverty. Access the conference website and download the event’s programme. Discover EAPN’s latest publication on participation of people experiencing poverty, Small steps, big changes.